Stately trees that shade a driveway, sidewalk, or patio area create enjoyable spaces year-round. But those stately trees often come with well-established root systems, including tree roots lifting concrete slab patios in search of water and nutrients. If the trees on your property are causing issues and damage to the driveway, sidewalk, and/or patio, call SkyFrog Tree Service. Our trained and certified team routinely prunes tree roots with Air Spade and finds a positive solution for you and your tree. Most foundations, once laid, don’t continue to grow and spread. But when it comes to trees, their foundation, or root system, is continually looking for aerated soil with proper moisture. Many times they grow until there are tree roots under driveway, sidewalk, and patio. Over time, you’ll notice these tree roots lifting driveway in Gainesville, causing the concrete to break. The breaking only increases as the roots continue to grow, which depending on the type of tree can be decades. Tree roots fall into two categories, structural and feeder roots. Structural roots anchor the tree and stabilize it as it grows. These roots grow horizontal through the soil and decrease in diameter as they move from the base of the tree. 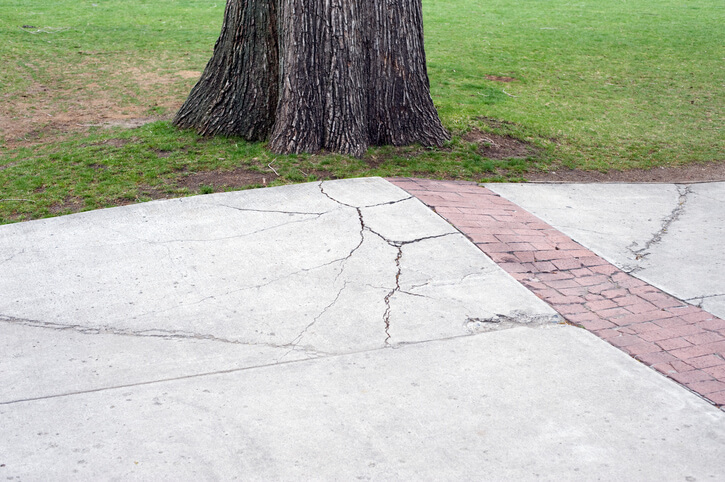 Tree root damage to driveways is often caused by the structural roots. Feeder roots are the many small, fibrous roots you see when the root system is exposed. These roots are responsible for absorbing water and minerals to feed the tree, meaning the tree’s ability to sustain itself can be hampered if the feeder roots are damaged in any way. This hand-held tool excavates soil by blowing compressed air, rather than the traditional mechanical excavation techniques of tree spades, shovels, and/or a trenching machine. These traditional techniques involve cutting tree roots under sidewalk or any concrete slab but not providing a long-term solution. By using a stream of air, the Air Spade lets us more precisely to move soil around roots, underground plumbing, and hard surfaces. Air Spade is less invasive, allowing us to see the structural and feeder roots without excavating portions of your landscape and the root system. The biggest benefit of letting SkyFrog take care of root pruning with our Air Spade is you’ll more than likely be able to keep the tree itself. Our arborists begin by examining the root flare, the upper portion of the root system connected directly to the tree trunk. The root flare gives us relevant information of the tree’s overall health, such as if the root system is structurally unsound. Pruning helps keep your tree(s) healthy. Root disturbance happens with construction, landscaping, and even soil shifts. These disturbances can sever the roots, exposing them and the tree itself to disease and a weakened root system. If there is disease, pruning isolates the diseased roots from healthy parts and stops it from spreading. An arborist from SkyFrog Tree Service has training and experience in pest and disease treatment and will be able to advise you on long-term care to keep your tree(s) as healthy as possible. Our trained arborists have worked with many tree roots lifting concrete driveway, sidewalks, and other parts of many homeowners’ property. By using Air Spade, SkyFrog Tree Service is able to rapidly move soil away from the root system and have a clear picture into the health and structure of the roots in question. With years of experience and training, we’re up-to-date on the best techniques and practices to not only save your tree, but re-route the roots so they don’t again cause issues for your driveway, sidewalk, or patio. To find a solution to the tree roots lifting driveway in Gainesville, call SkyFrog Tree Service today!